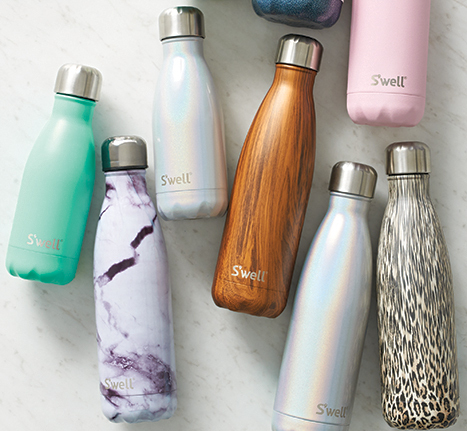 This month, we’re thrilled to feature the creator of the water bottles we all know and love: S’well. We chatted with Sarah Kauss, founder and CEO of S’well, to find out how she started this incredible company, what inspires her, and what she sees for the future of the brand. How did S’well get started? The idea came to me while hiking in Arizona with my mom. Even though I had always used a reusable bottle, it was in that moment when I took a sip of warm water that the idea for S’well came to life. My hope was that, by creating a bottle that worked and looked better, more people might want to use it and we could do more good in the world. Luckily, the idea took off! The inspiration was two-fold. I wanted to create a premium brand that was fashion-forward but also a bit nostalgic — a reminder of a time when life was simpler and things lasted longer. Today, S’well continues to evolve by following the fashion trends and collaborating with an array of established designers, fashion brands and up-and-coming artists to create fresh looks throughout the year. What are your favorite features of S’well water bottles? That’s a tough question! I love everything about our products from the way they look to the way they work. But maybe, if I had to choose, it would be the fact that our 25oz bottle holds a full bottle of wine. How many different designs does S’well offer? We have over 200 designs and now an array of different forms to help everyone have a S’well that fits their lifestyle, at home or on-the-go. Thank you for asking this question – it is such an important program! Since 2015, we’ve committed $800,000 to help UNICEF USA build infrastructure, educate families and provide clean, safe water to the world’s most vulnerable communities. Our most recent efforts will provide 500,000 people in Madagascar with access to clean water by 2019. Only 52% of the population in Madagascar has access to clean water and only 12% has access to proper sanitation. But we know that young girls stay in school longer and mothers have the opportunity to find vocations outside of the home more easily when they have access to these necessities. So I love that this program gives everyone, but particularly women, a chance to realize their full potential and go after their dreams. What do you see for the future of S’well? We have so many new developments for the year ahead. We’ll be launching new products, new collaborations and new designs, while continuing to expand internationally. In the process, we’re going to keep trying to protect the planet and empower future generations! What advice do you have for a young entrepreneur? Don’t wait for your idea to be fully baked before dedicating time to bring it to life. Focus as much time and energy as you can to making your idea a reality. To shop the full S’well collection available at Paper Source, click here.